Lubrecht: It's time to visit the forest! Students like these use Lubrecht as an outdoor classroom and faculty and graduate students conduct research on the forest. 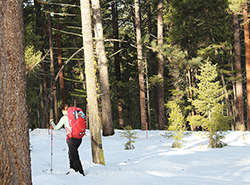 We have more than 12 miles of trails groomed in winter for cross-country skiing. Dogs allowed. We're grooming on Fridays in 2017/18. Lubrecht is the place to stay! Lubrecht has lodging options for individuals and groups. Lubrecht Experimental Forest is managed by the W.A. Franke College of Forestry and Conservation at the University of Montana as an outdoor classroom for our students and a recreational retreat for the public. Lubrecht has ski and hiking trails, lodging, and conference services.